Okay, you get an idea! If not, let me tell you once again how much I love coconut! Science says that 70% of human body weight is made of water. For a Mangi (read Mangalorean), atleast half of that water weight in my body contains coconut in it! For someone who comes from the land of coconuts where tall and majestic coconut tress sway to the gentle breeze from Arabian sea, it is no surprise that most of the regional recipes has coconut as one of the main ingredients. 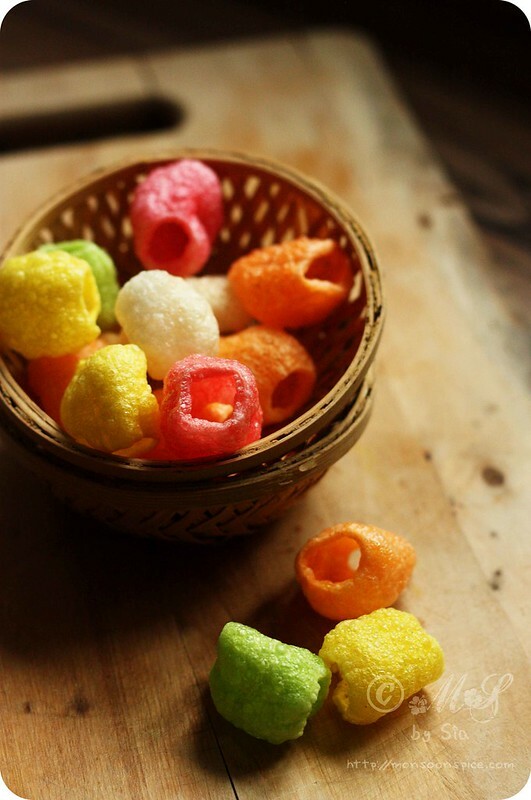 Our obsession with coconut can be seen in the wide range of food we cook, both savoury and sweet. 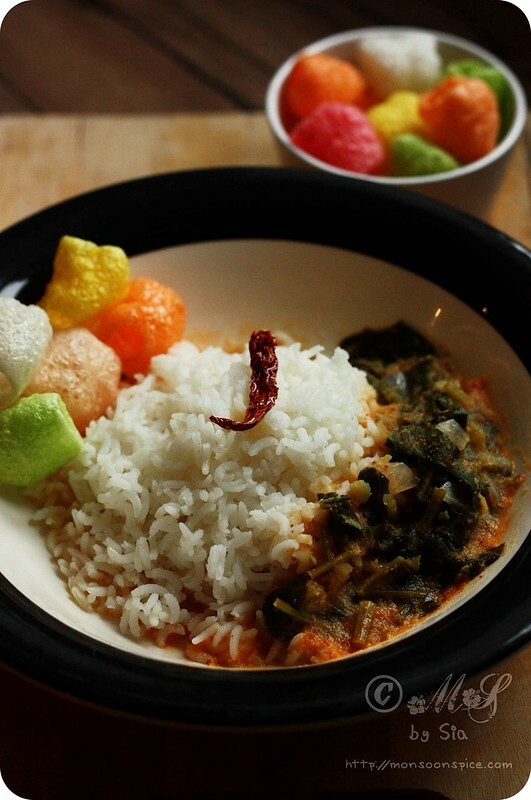 The use of coconut is not just limited to coconut based chutneys or Kurma. We cook different vegetables and legumes in spicy coconut based gravy called Kodhel and Gashi, we make chilled yogurt and coconut based Tambli with raw or cooked vegetables, green leafy vegetables and also with array of sundried fruit peels. We love the mild coconut and buttermilk based Majjige Huli, creamy Bendhi and we also adore the banana leaf wrapped steamed rice cakes stuffed with sweet jaggery and fresh grated coconut called Genesale! There are coconut based dosa (pancakes) and dumplings (pundi) and coconut milk based Rasayana. And who can forget our love affair with coconut milk based Payasam that is not just refined sugar free but also vegan. From spicy, sweet and sour Menaskai to simple vegetable stir fries called Palya to fresh vegetable or lentil salad called Kosambari, we liberally and lovingly use coconut in every dish. Be it coconut rice or coconut chutney, our love for this versatile ‘fruit’ is something that can’t be expressed in mere few words! Most of my weekday cooking involves many Udupi-Mangoleran recipes; something that grew up eating, enjoying and appreciating. I honestly believe that the most simple and everyday recipes are the most difficult ones to master. Not because they involve complex techniques or requires the rare ingredients. In fact the ingredients used in Udupi-Mangalorean cuisine are the most basic ingredients that are easily available and the cooking technique is very simple and straight forward. Not wanting to be tagged as narcissist, but unable to find any other way to express myself, whenever I cook food from my home they not only take little time to cook but ALWAYS taste good! But every time I put a spoonful of food into my mouth I feel something missing because they NEVER taste like the ones cooked by my Amma or Grandma! And then I discovered the secret ingredient! It’s called patience; one thing that I sadly lack! But motherhood is something that makes even the most impatient person to learn and practice the new lessons of patience; taught by one bouncy little bundle of ‘hopping beans’ ;) So after cooking on my own for all these 7+ years, I have at last understood the secret behind the food cooked by my mother and grand mother! Be patient when choosing the ingredients as it is the quality of the ingredients that plays key role in producing one the best tasting dishes. Don’t be in a mad rush to cook as the little care and attention given to the ingredients while cooking helps to build harmony among the ingredients which in turns helps in creating some of the best food you have ever cooked. It doesn’t matter that the food you are cooking is simple or the ingredients used are quite ‘common’ or even ‘boring’! What matters is the end product; one spoonful of food that makes everyone appreciates the love and care that went into cooking the ‘everyday meal’. So armed with new found ‘patience’, I dived into making one of the most loved Konkani dish called Palak/Spinach Ambat that makes its appearance every month in our dinner table whenever I get hold of fresh bunch of spinach. 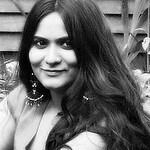 It is wonder that it never made any appearance here in my blog all these 6+ years of blogging! There are many Udupi-Mangalorean recipes that I cook on day to day basis but for some reason never photographed or blogged. Although the most of the dishes are far from being photogenic, I plan to post them more often as some of the best tasting food is the simple everyday food and they need to be put under the lime light for their simplicity, taste and authenticity! 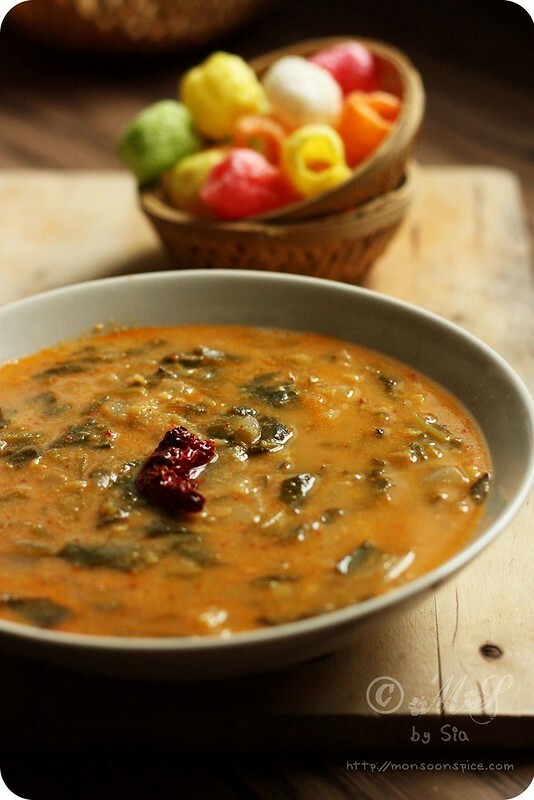 One such recipe is Palak/Spinach Ambat where the spinach is cooked in creamy coconut and lentil based gravy with slight hint of sourness from tamarind. 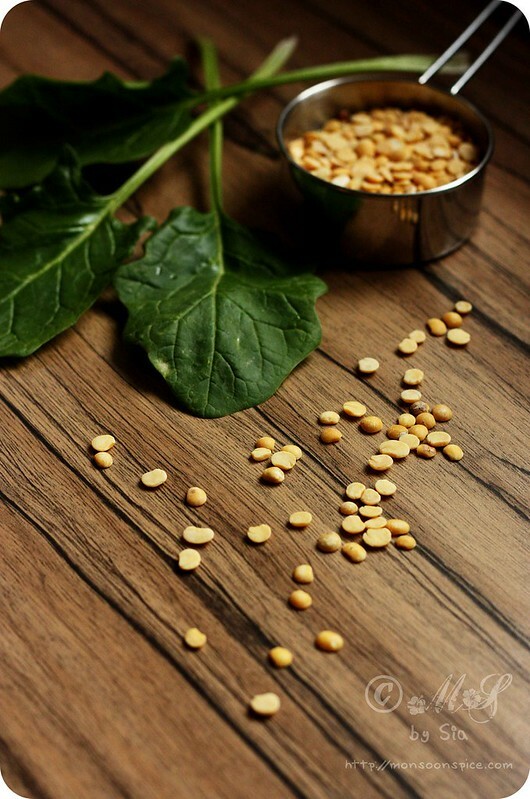 Traditionally they are made using Malabar Spinach (also called as Basale in Kannada and Vali in Konkani). Malabar spinach has thick leaves and hence is more ‘meaty’. But the spinach or palak works just fine. You can up the spice level by adding more chillies but I make it bit milder as my toddler loves it too. 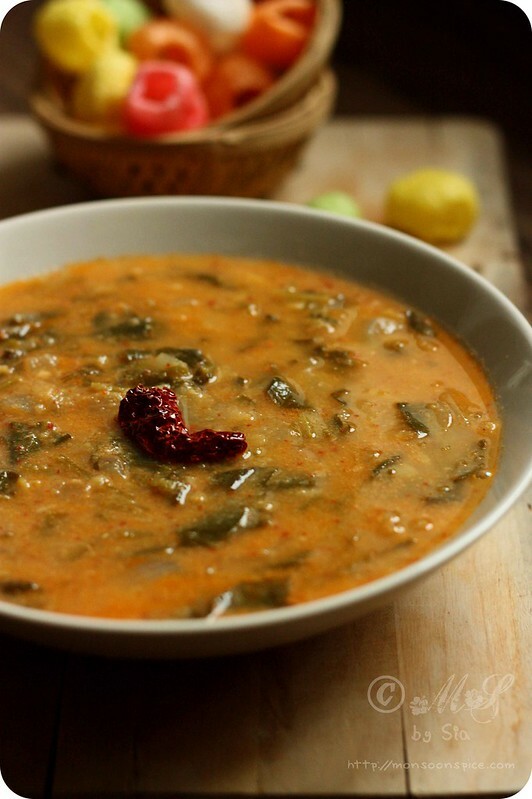 Use of both coconut and toor dal lends creamy consistency to the Palak/Spinach Ambat and the hint of sourness is lent by the use of tamarind or Kokum or sometimes by Bimbli. 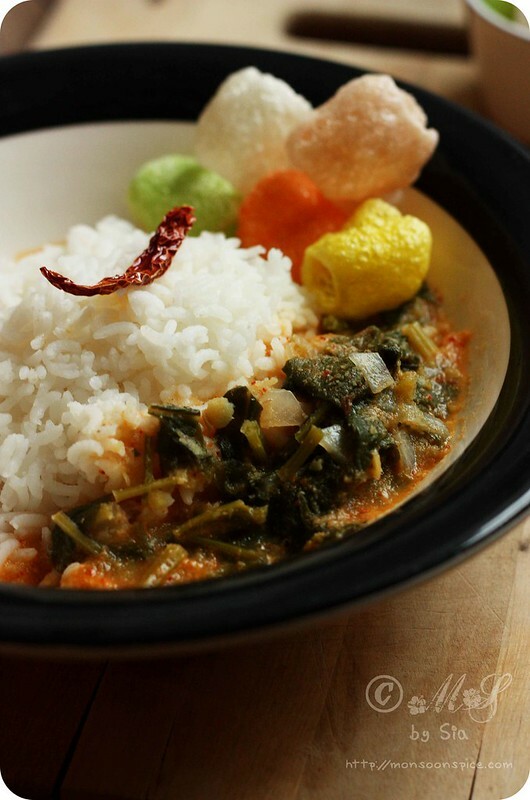 It really is one of the quick and simple things to cook, like most of Udupi-Mangalorean recipes, as most of the cooking is done with the help of a pressure cooker. I usually serve this Palak/Spinach Ambat with plain rice, ghee and papad but it also tastes wonderful with any Dosa, Idli and even with chapatti. 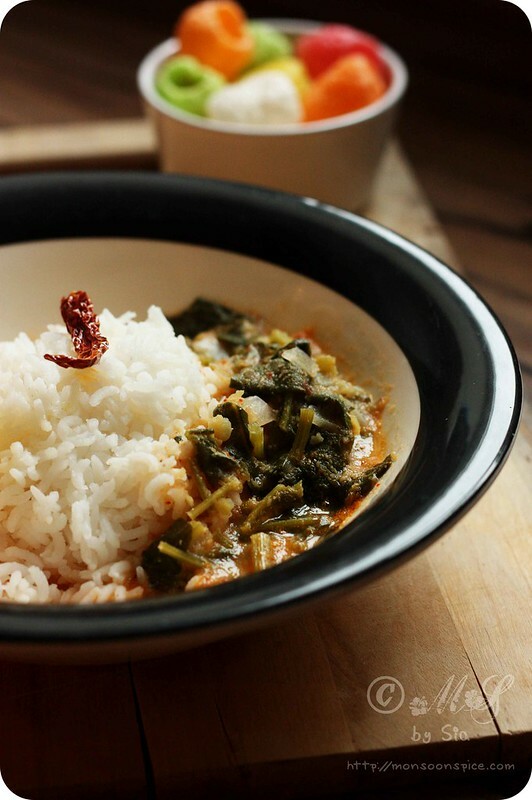 Psst… There are times when I slurp a bowlful as a Soup on cold winter days ;) So shall we start cooking one of the simple and delicious Konkani delight? Wash toor dal 3-4 times to remove any impurities and transfer it to a pressure cooker. To this add chopped spinach, onions and jaggery. Add about 3 cups of water and cover the lid. Cook it on medium flame for 20-25 minutes or until the toor dal is cooked thoroughly. 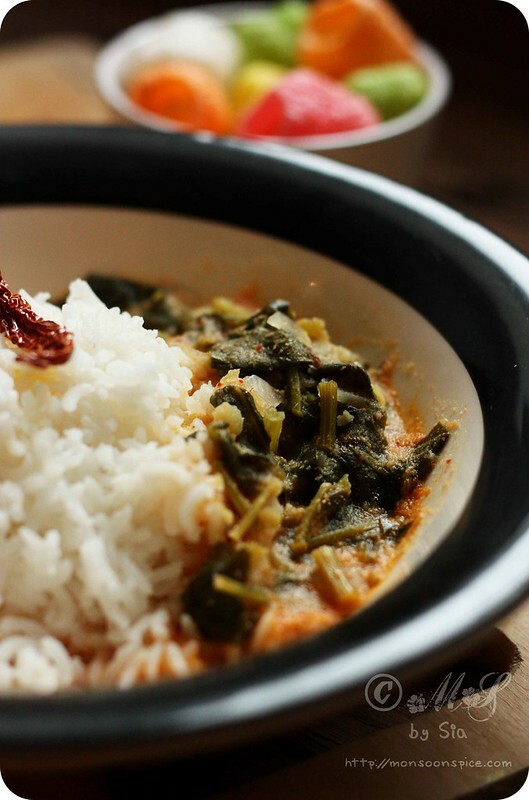 While the dal and vegetables are cooking, prepare the coconut paste. Heat oil in a tadka pan and add broken dry red chillies. Fry them for a minute on a medium heat. Make sure that you don’t burn the chillies as the burnt chillies will make the gravy taste bitter. 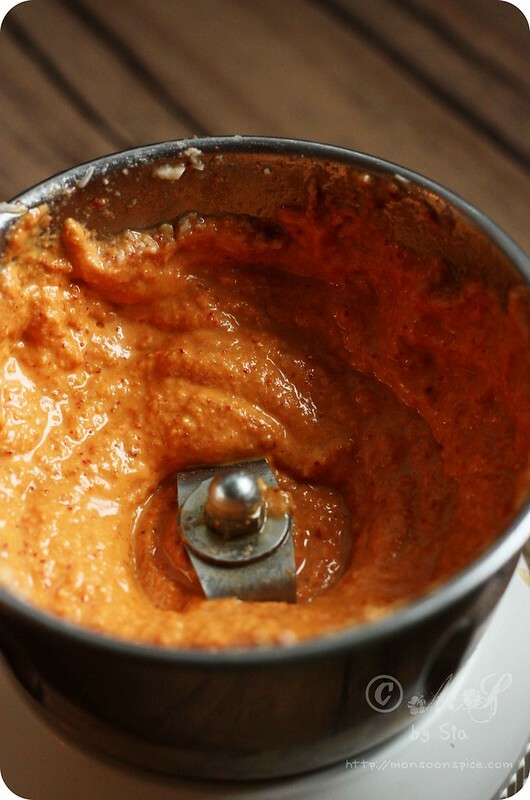 Transfer the fresh/frozen grated coconut, tamarind paste/pulp and roasted chillies into a mixer or food processor and grind them to smooth paste by adding very little water. Keep it aside until needed. Open the lid of the pressure cooker once the pressure is released completely. Transfer the contents to the large pan and mash the dal by pressing them gently with a back of a ladle. Switch on the gas and reduce the flame to medium. Transfer the ground coconut paste to the dal and vegetables and add salt to taste. Cook on a medium flame for 5-7 minutes until the curry comes to gentle boil. Switch off the flame and let it rest for atleast 15 minutes for all the flavours to blend well. Serve this delicious Palak/Spinach Ambat hot with plain rice, ghee and papad or you can also serve it as a side dish to dosa or chapatti. Enjoy! 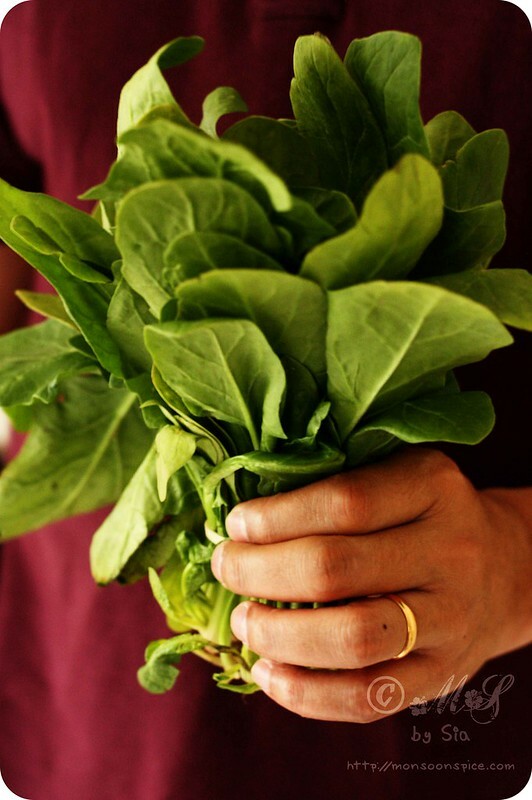 Spinach is one of the most loved green leafy vegetable at our home. Whenever we pick a bunch of fresh spinach from Indian grocery, it comes with impurities like dirt and sand. The simple way to clean the spinach is to rinse it well under running water and then chop them. Once chopped, place them in a large bowl and add water to it. Let it sit undisturbed for few minutes as all the impurities will settle on the bottom of the vessel. 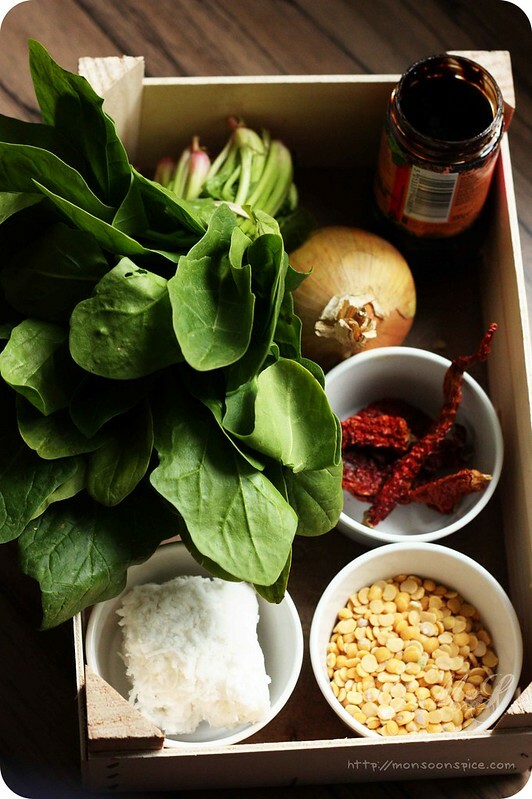 Remove the spinach and transfer it to colander and discard the water with all the impurities. I repeat the step 2-3 times to make sure almost all mud and sand is washed away! 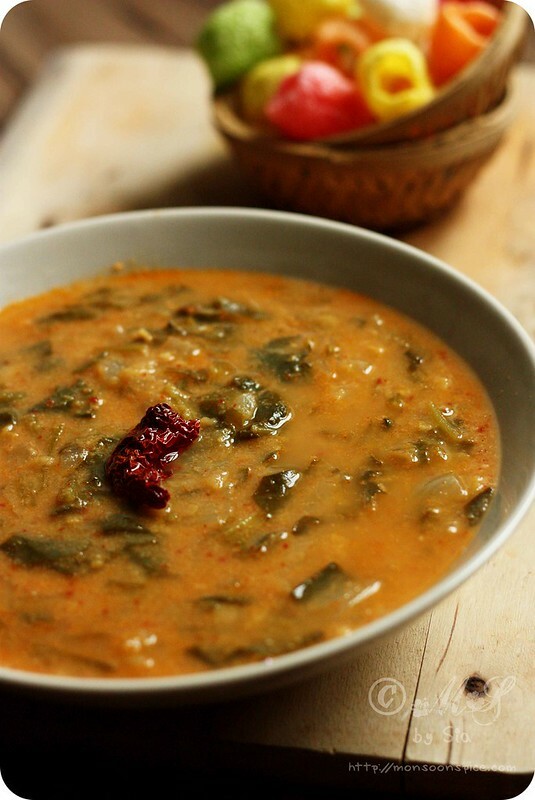 You can add the tadka of garlic or onions to the Palak Ambat recipe. For this, heat about 1 tbsp of oil and add either 1 tbsp of roughly chopped garlic or finely chopped 1 small onion. Fry them till they turn golden brown and add it to the Palak Ambat just before you turn off the gas. Mix them well and let it rest for 15 minutes for all the flavours to blend well. You can also make carrot, potato or chayote squash Ambat. A beautiful recipe! What a great combination of ingredients. Yummy! Looks very comforting and yummy.. I have never had this but the recipe sounds so good. I agree coconut makes everything taste so yumm. I couldn't agree more about the awesomeness of coconut. I have to remind myself not to add some in most things I cook. Yes, we're back Sia :) Back to bone-jarring cold - a bit of a shock to the system, but pretty much settled back in now. Hi, you can also add 1/4 tspn of roasted fenugreek seeds to the ground paste for better taste.